NORCO’S Ball Reverser Actuator is a unique actuator which provides automatic reciprocating action. The Ball Reverser has a wide range of applications throughout many industries. There are six standard sizes: 1600, 1700, 1800, 1900, 2000, and 2100, each offering two screw materials. The prefix BR designates alloy steel case hardened to 56-60 Rc. The prefix BRC designates stainless steel through hardened to 40-45 Rc. in order to maintain appropriate design limits. The load and lie selection process which follows will determine which size BR or BRC is suitable for your application. 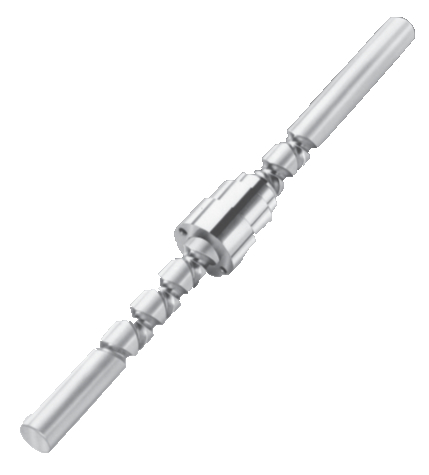 Ball Reverser life is rated in L10 hours of the nut assembly or screw, whichever is lower. The L10 life is defined as the number of hours that 90 percent of the units will exceed without failure. All life calculations are based on a “friendly environment,” i.e., proper lubrication and alignment, no shock loading or other abnormal conditions.